Title: "Seattle Art Museum: De Kooning"
Willem de Kooning was a Dutch-born American painter who was one of the leading proponents of abstract expressionism. Born in Rotterdam, the Netherlands, in 1904, Willem de Kooning stowed away to the U.S. in 1926 and settled in New York City. 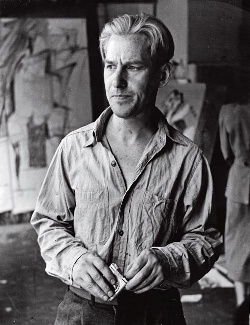 While working in the commercial realm, de Kooning also was developing his artistic style, exploring both figure painting and more abstract subjects through the 1930s. By the 1940s, those two main tendencies seemed to fuse perfectly, notably in Pink Angels. De Kooning became known for his depiction of women, and women would dominate his paintings for decades. Later in life, de Kooning explored landscapes and even sculpture, before Alzheimer's disease made it impossible to continue on. He died in 1997 at age 92. Some of De Kooning's paintings have been sold for (near) record prices. In November 2006, David Geffen sold his oil painting Woman III to Steven A. Cohen for $137.5 million, just below the then record $140 million transaction the same people had in the same month for Jackson Pollock's No. 5, 1948. A month earlier Cohen had already paid Geffen $63.5 million for Police Gazette. In September 2015 David Geffen, again, sold De Kooning's oil painting “Interchange" for $300 million to hedge fund billionaire Ken Griffin. As of 2016 this is the highest price paid for a painting, even when inflation is taken into account, perhaps matched by the sale for "close to $300 million" of Paul Gauguin's When Will You Marry? in February 2015. Sheet Size: 26" x 30.75"
Title: "Moderna Museet: Willem de Kooning"
Image size: XXXX" x XXXX"
Sheet size: XXXX" x XXXX"
Framed size: XXXX" x XXXX"